Click on any city to find a beach rental and coast vacation rentals for that city. You will find listings for Washington State cabin rentals and beach rental condos. Washington Coast vacation rentals are a great way to enjoy the beauty and have a spectacular vacation. The Pacific Northwest is known for its beautiful mountains and coastal scenery. The rugged beauty of Oregon and Washington's mountains, seacoast and forests attract millions of tourists every year. The coastal range borders the Pacific Ocean from Washington's Olympic Peninsula on the north to the Klamath mountains of Oregon on the south. The rolling coastal ranges run parallel to the coastline. They are the lowest of the two major north-south mountain ranges. The other range being the Cascades. Douglas Fir, Hemlock, Spruce and other evergreen trees cover much of this coastal mountain area. From late autumn through much of the spring moisture laden winds from the Pacific Ocean bring persistent rains to this coastal strip and to the slopes of the coastal ranges. The average annual precipitation varies from about 60 in. near Coos Bay, Oregon to more than 100 inches on the Olympic Peninsula. This area in northern Washington and the mountains directly behind constitutes one of the wettest areas of North America. The summers are comparatively dry because the storm tracks shift further north. The rains combined with the rugged coastal mountains give rise to some of the most spectacular natural beauty in the world. In the North of Washington. The rain forests of The Hoh Valley's has large old growth trees hung with moss, the ground is blanketed with ferns, and possible sightings of deer and elk make this one of the most visited places in the world. 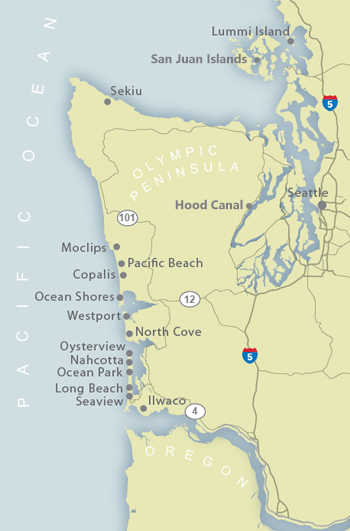 Along the southern coast of Washington State is the Long Beach Peninsula. This 28-mile long spit of sand separates Willapa Bay from the Pacific Ocean. At its southern end is the community of Long Beach.